After last night’s sorry performance, expect more calls for Bush to exit the race. After Wednesday night’s cringe-inducing debate performance, there’s no longer any doubt: Jeb Bush doesn’t want to be president. There was one moment, early on, when it seemed otherwise, and Bush went directly at Senator Marco Rubio for his absenteeism. That was it. Bush didn’t follow up, which left the unmistakable impression that he thought Rubio was right. (And he probably was.) He was never a factor again—except maybe when he grossed out the audience by promising a “warm kiss” to any Democrat who wants to cut federal spending. I’m not sure what the debate proved, except all the GOP candidates are running against reality. The debate made obvious what’s been pretty clear for quite a while: Bush is among the many lower-tier candidates who lacks a rationale for his campaign, and who needs to leave the race if so-called “establishment” Republicans want to defeat outsiders Donald Trump and Ben Carson. At the Daily Caller Thursday morning, Matt Lewis concluded, “It’s time for Jeb Bush to call it quits.” Expect more such calls in the days to come. Other than that, I’m not sure what the debate proved, except that all the GOP candidates are very angry, and they’re running not so much against one another as against reality. Virtually all of them attacked the allegedly liberal mainstream media; ABC News counted 12 media hits; I lost count. From Rubio, who blamed the media for hyping his absenteeism while ignoring that of Senator Barack Obama in 2008, to Senator Ted Cruz, who played the unlikely role of peacemaker among his rivals as he attacked the moderators for baiting them, most of the candidates seized a moment to bash journalists. It got lots of audience applause and lit up social media, but nobody is likely to get the boost Newt Gingrich got in 2012, when he hit moderator Juan Williams in the Fox debate in South Carolina. By now it feels standard for GOP candidates to hit the media, malign debate moderators, and mostly ignore the issues. For instance, the same day the House passed a landmark budget agreement under departing Speaker John Boehner, the candidates hardly mentioned it, with Senator Rand Paul making a wan promise to filibuster the deal (he, like Bush, ought to be finding his way to the exit). There was a chance for a genuinely dramatic debate on Social Security, but erstwhile program defenders Mike Huckabee and Donald Trump surrendered. Huckabee defended Social Security recipients but not the program, calling it “confiscation.” It would have been a great time for Trump to jump in—but he seemed to have fallen asleep, after landing an early punch at Ohio Governor John Kasich, the supposedly working-class candidate, for going to work for Lehman Brothers. Kasich did so much shouting that Larry David ought to play him on Saturday Night Live, with different hair. All eyes were on Kasich, whom the media keep heralding as a potential successor to Jeb Bush for the mantle of establishment favorite. But after getting a lot of attention for attacking Trump and Carson as “crazy” earlier in the week—for their extremism on immigration and ending Medicare, respectively—Kasich overplayed his moment. He berated moderator John Harwood for not letting him lay into his rivals early on—when Harwood was actually inviting him to lay into his rivals. Kasich did so much shouting that Larry David ought to play him on Saturday Night Live next, with different hair. Seriously, he was angrier, often inappropriately, than David’s caricature of Senator Bernie Sanders. Next debate, if he’s part of it, he should skip the Red Bull. Trump and Carson were so much less impressive and sharp, in my opinion, than any of the single-digit guys. But I’m not going to predict what happens. Ben Carson showed, again, that he’s totally out of his depth. Confronted with evidence that his 10 percent “tithing” plan would open a huge deficit, he said he was proposing more like 15 percent—and he’d “get rid of all those deductions and loopholes.” He made no sense. Carson has the strange habit of closing his eyes for an unnerving amount of time when he answers questions, as though he hopes his interrogator will just go away. But I’ve thought Carson was bad in all three debates, and he’s continued to rise. Likewise, in all three debates, Rubio has been judged the winner—only to see his poll standing tick up by a couple of digits, if that. This time though, Rubio’s strong debate performance could matter more, because it came at the direct expense of Jeb Bush. If Bush left the field, and his money and roughly 8 percent support went to Rubio, the freshman Florida senator would be creeping up toward 20 percent, within shouting distance of Trump and Carson. 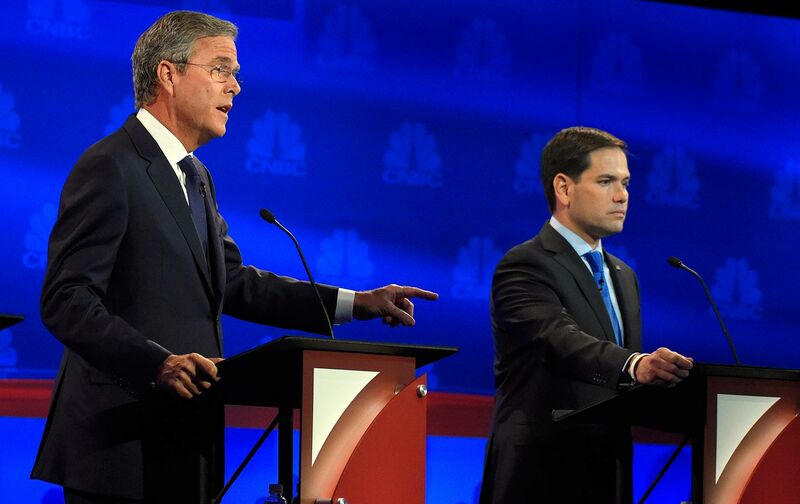 If Bush stays around, Rubio will have a tougher time jumping into that top tier—but a much easier time than Bush will. If Bush jumps anywhere at all, expect it to be out of the race. A note to readers: My daughter is going to work for Hillary Clinton’s campaign in Iowa next week. At 18, she cast her first vote for Clinton in the California primary, so this is a dream job, and I’m very proud of her. I will continue to cover the campaign, and the issues that animate it, fairly and honestly. In the interest of transparency, though, I wanted to share the news with readers.